Excellent that the secondary is Cervit. Since a cassegrain secondary can have a power from 2x to 5x or even more, you don't want the figure changing with temperature since it can have a large effect in image quality and focal position. As for the using the Sun I think that is your best bet in finding the focus at the cassegrain focal plane. I was just try to point out that the diameter of the image your going to get isn't got to by a point but a very large disk. So you need to look for that. Edited by DAVIDG, 30 November 2018 - 09:40 AM. big difference and the sagitta is .030" thirty thousandths. Do you think the secondary fits the prescription? Edited by clamchip, 30 November 2018 - 12:17 PM. Doing a little math, the sagitta = r2 / 2 R and we know that r = 2.6875 / 2 and S = 0.030 I get a radius of 30.09". Assuming that the design calls for a 4x secondary, the cassegrain focal length is going to be 173.0". Doing a bit more math and I find that with a 30" radius on the secondary and 173" focal length the back focal is 13" behind the primary and the separation between the primary and secondary should be 32.0" So the reason why you might not be able to get an image is that the secondary needs to go back more. Edited by DAVIDG, 30 November 2018 - 12:28 PM. RC = 2 x 10.25 x 41 = 27.3"
So the sag of .03 is in the ballpark. Here is another way to find the approximate position of the secondary. You'll need two people and a finder scope or binoculars that are focus at infinity. Tape a bright light like LED to the end of the eyepiece focuser tube. 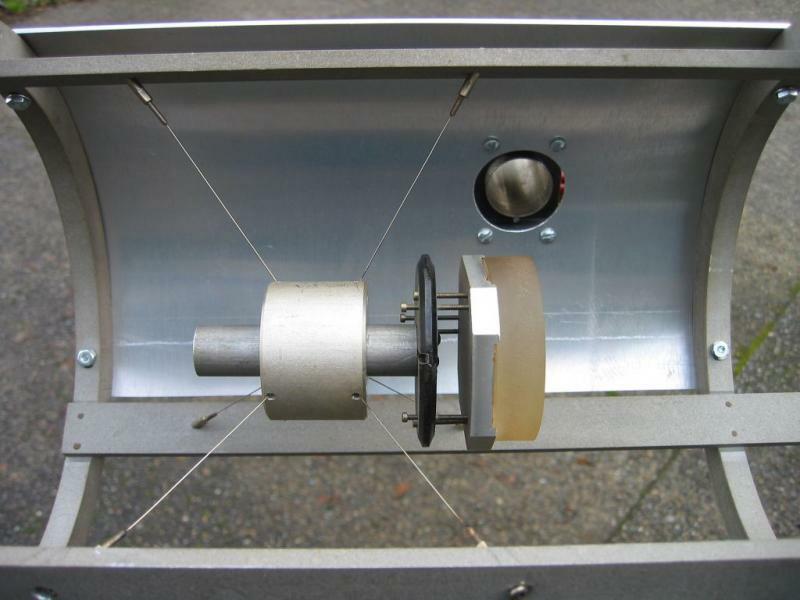 You may want place a star diagonal in the focuser tube and tape the LED to where the eyepiece would go. The star diagonal will give a couple of more inches of back focus and the scope should have been designed to work with one. Stand back a couple of feet from the scope and look through the binoculars/finder into the scope ( ie at the primary) You should see the light bulb. Now have someone rack the focuser tube through it's full range of travel and see if at any time the bulb comes into sharp focus. If not move the secondary a little and try again. Hopefully you will find a spacing of the secondary that the bulb comes to focus. Since the secondary is most likely not figured, you most likely won't find a sharp image but still you should see one that isn't too bad. Thanks you two, I would not be able to work on this telescope without your help. I'm going to try the new numbers tomorrow. focal plane is going to be around 45 inches. Yes, if the RC of the secondary is 30", it's f.l. will be 15". The secondary, according to the parameters that we guessed at, should be about 33" from the primary. But I think you said the professor's measurement was 30-3/4". What distance do you have in your set up? As was said, small movements in the secondary can move the final focus a lot. Since we don't have the actual parameters (I love that word), finding focus may not be easy. It will be a lot of trial and error. I won't show the math, but I played with the formula with the parameters from before, just to give you an idea. Starting with the secondary 10.25" inside the f.l. of the primary, the final focus would be 41". (10.25 x 4 = 41). Now if we move the secondary away from the primary by .25", the focus moves to 37", 4" in, and the amp changes to 3.7. So moving the secondary away from the primary, moves the focus in, and vice versa. I then plugged some other number's in. If the separation of the mirror's is 30.75", as the professor had. And you had a sagittal of .03 giving a RC of 30". But something isn't right, for if I use the RC of 30" and have p = 12.5", plugging the numbers into the formula, p' becomes 75", not 50". Sorry, that was a little math, just to show that something is wrong. So, it's just going to be a lot of trial and error, of moving the secondary around to get a BFL of 8 to 10". I hope I haven't made this discouraging. In #598, what is the distance between the secondary and the primary? Edited by clamchip, 30 November 2018 - 09:20 PM. Hmmm, doesn't look like there's much room to move it back. If you could just get a good far away light source, the whole set up could act like an optical bench. Or a flat and use DP. Maybe you could make a sliding section to mount the secondary, that fit inside the tube. You need to find a focus somewhere. A minor technical detail, the secondary is convex so it doesn't have a focal length on it's own since the light reflected off the the convex surface is divergent. So in this application it increases the focal length of the primary. Since this is a home made instrument you always have to consider that the radius on either or both of the mirror was not made to spec. When you make a mirror for a Newtonian if you miss the exact focal length it is not an issue. It is easy to calculate the correction and easy to modify the design of the OTA to fix the actual focal length. It's a different story when you have a multi-element system and the elements all have optical power. Now the radius, spacings and figures all have to be within tolerance or it wouldn't work. The need to work much more accurately is missed by many ATM's when they decide to try a system more complicated then a Newtonian. So when things don't make sense, don't rule out the optics weren't make correctly. To solve this mystery you need the exact radius on the secondary. Once you have that you can calculate if it will work with this primary or not. Edited by DAVIDG, 01 December 2018 - 09:44 AM. I wonder if a Coordinate Measuring Machine (CMM) would be able to give an accurate radius of the glass? I know they can take a great number of point readings and integrate them all together. I have one of these at the shop and if Robert wanted to ship the secondary to me I could measure it for him. As the old saying goes " You need the right tools for the job". A simple ring spherometer or lens gauge will measure the radius of the secondary to the needed accuracy. Here is a picture of mine. I made the ring spherometer from a brass tubing fitting that I faced off the end so the ID and OD are sharp edged. I then accurately measured the OD and ID. A digital micrometer fits in it, so by measuring the deflective and knowing the ID and OD of the surface that touches the glass you can calculate the radius. The other option is inexpensive lens gauge that is used to measure eyeglasses. It reads out in diopters but that can be converter into a radius. and even the blur doesn't change while focusing. I decided to try Dave's idea with the the light bulb in the focuser tube. telescope viewing the bulb off-axis in the primary. I found the best light bulb filament focus was with the bulb 1 inch in front of the primary! out in small increments but never could get the same focus. I wish I could place a eyepiece and my head at 1 inch in front of the primary! I set up a small refractor and put a light in the focuser. I went and stood 16' away with a pair of binoculars. 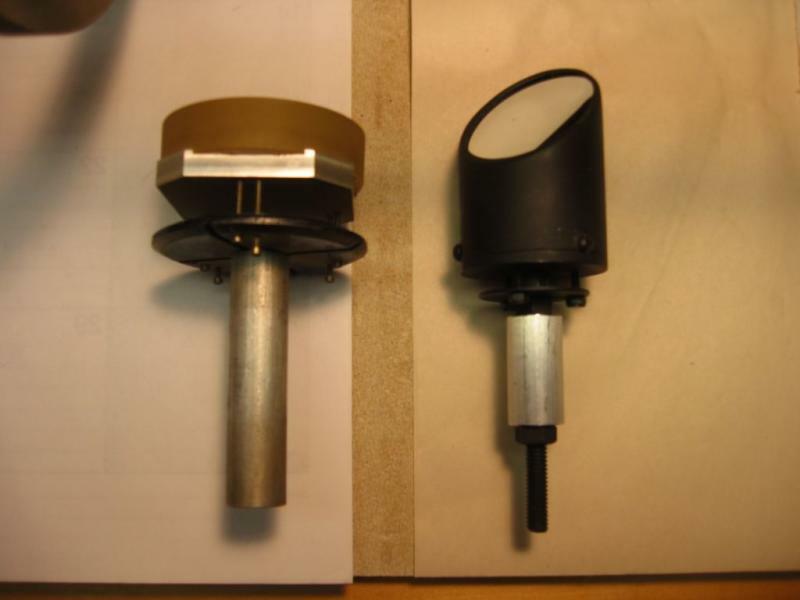 I could read the writing on the bulb, whether the focuser was racked all the way in or all the way out. I'm sure that the light coming out of the scope the opposite way is suppose to be parallel light, if the bulb is at the f.l. of the lens. I'm sure I understand the concept. If I did something wrong, I don't know what it is. Maybe the binos are just too forgiving with my eye. Clamchip, try another scope and see what happens. Edited by Garyth64, 01 December 2018 - 08:51 PM. When you place a light source at the infinity plane of a telescope then the light exiting the telescope in theory is parallel. So if another telescope or binoculars that is also focused at infinity is used to examine light exiting the telescope, the light bulb will also be in focus. If the light bulb is not at the infinity position of the telescope then the light exiting the telescope will be either divergent or convergent. So the bulb will act like one that is closer then infinity. So the object in the binocular or other telescope will not be in focus. I have used this methods many time to focus the optics in spectroscopes and also to focus finders so they are at infinity so I can find objects that Venus and stars in the daytime. If the focus is even slightly off the objects would be invisible in the daytime. Try using your binoculars that are perfectly focus at infinity to look down into a finder that has cross hairs. If the finder is focused at infinity the cross hairs should be in sharp focus. Then defocus the finder and the cross hairs should also go out of focus. when the mirror spacing and focus were adjusted. The only thing is sharp focus was one inch in front of the primary. And anything I tried, like moving the secondary, or the light source, only made it worse. 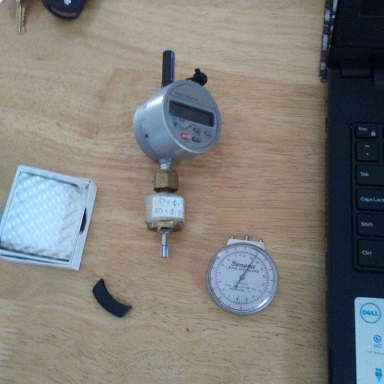 I think I should build a Spherometer. Like Dave mentioned I've got to know the exact radius of the secondary. I have all the necessary parts to build one and a flat to zero the micrometer head. I took this picture in 2011 in Pearl Harbor at the USS Arizona Memorial, 70 years after the attack on December 7th, 1941. 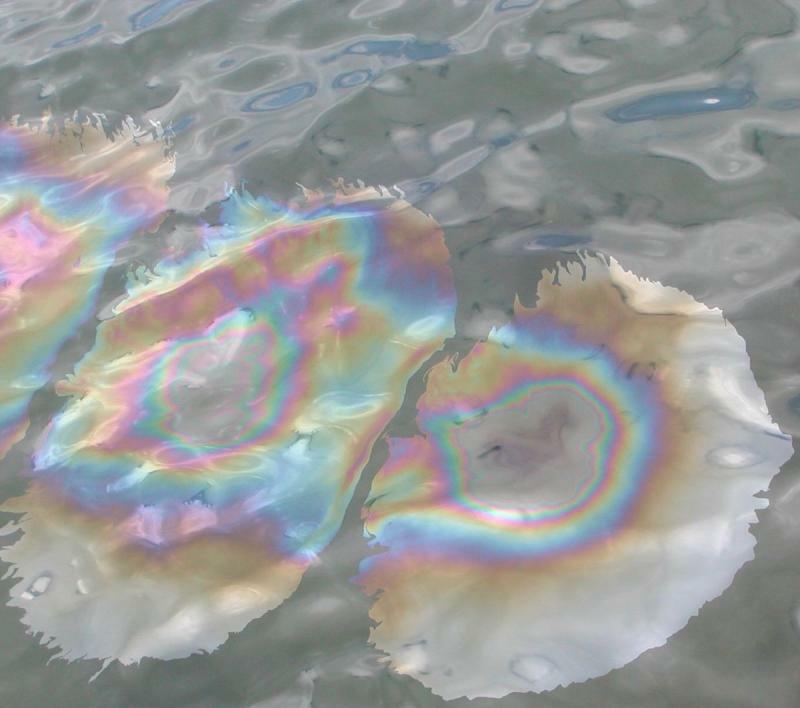 Oil is less dense than water and so when a drop floats to the water’s surface it disperses radially into a thin film. When a beam of white light strikes the top of the film a portion of it is reflected upward at an angle, equal to the angle of incidence as measured from a line perpendicular to the surface. The oil is transparent and so some of the light is transmitted downward through the oil. This light is refracted or bent downward slightly, more toward the perpendicular. Each of the colors corresponding to the beam of white light have different wavelength and so travel through the oil at a slightly different velocity. Violet light travels more slowly than red light and is thus refracted more. The angle of refraction lessens slightly with each wavelength, each color- VIBGYOR. At the bottom surface or interface between the oil film and the water, reflection and refraction again take place. This secondary upward reflection occurs along a slightly different path and the difference between the two light rays causes interference. As the oil drop spreads out radially from its point source, it thins. This produces differing thickness of oil outward, resulting in a lens-like effect. This results is a slight difference in path length. The combination of these factors produce a circular a rainbow-like pattern across the surface which is distorted by ripples and currents in the water. The diesel oil still percolates up from the fuel tanks of the USS Arizona. A sad and solemn reminder of the nearly 1200 US service men (USN and USMC) still entombed in her. The smell of the oil is still strong. The rainbow colored haloes form and drift away as each drop rises which to me was symbolic of the ascending souls of the men who perished on her. REMEMBER THE ARIZONA! 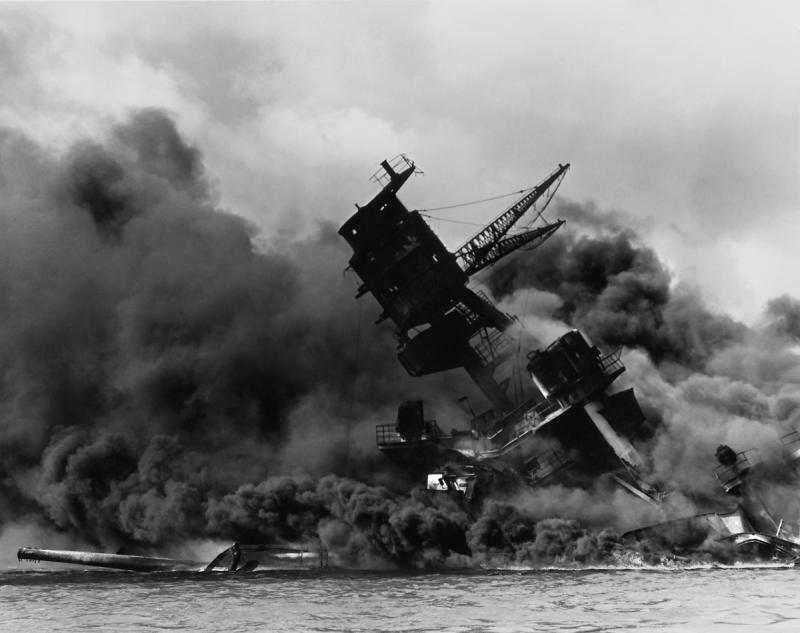 My late father inlaw, a navy vet from WW II, once told me that according to legend the USS Arizona will stop leaking oil when the last of her crew passes. Sadly, none of the surviving members of the USS Arizona are still with us. They’re all 2,512 officers and crew topside now! She continues to leak approximately 9 quarts of diesel oil a day. In an odd coincidence, both my biological father (Marine, Gunnery Sgt.) and my father-in-law (Army, Master Sgt.) were at Pearl Harbor on the day of the attack. (Neither ever knew each other to my knowledge.) Another weird coincidence, it was my father-in-law’s 28th birthday, (he went in at 16). Both survived WWII. "You know your a equipment freak when..."
Edited by clamchip, 10 January 2019 - 11:45 AM.